Click on the link to the IRIN article below to read about how learning farming skills is one way to help the growing generation of orphans and vulnerable children. Song and dance are a huge part of Swazi culture. 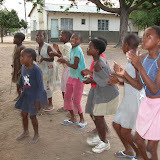 The children we care for love to dance and sing. Recently, a young man of the community had passed away due to complications from HIV/AIDS. Sr. Diane attended his funeral, and all the family and friends were just devastated. There was so much sadness in the room, but then, the pastor spontaneously started to sing. Soon everyone joined, and began to dance as well. The song was kind of upbeat and happy, but everyone used the music and dance to work out their feelings, deeply expressing the pain and suffering of the community, in such a powerful and positive way. To hear this song and see this dance was so moving and gave Sr. Diane and the mourners there great hope after such a loss. This is what music and dance mean to this culture. We hope to be able to share the voices of the children with you soon, as audio clips on the Blog, so stay tuned! For now, click on the photo album below to see pictures of the children during their free time on the grounds playing and singing and dancing.